Four-year-old Delilah O’Donoghue’s earnest lecture on behavior to her two-year-old brother Gabriel could be about to make their family a fortune. Saturday night their father Lee O’Donoghue told how he had initially posted a 65-second video clip of his children on YouTube thinking simply that friends and family could find it amusing. Within days it had become an internet sensation, attracting more than half a million viewers as well as requests for interviews from media outlets here and in America. Lee O’Donoghue and wife Alex, from Balsall Common, West Midlands, UK, described the interest in the video as “surreal”. The 42-year-old said he began filming on his smartphone about two minutes into the little girl’s scolding. “I watched from afar until I realized he must be really getting it from her,” he said. Alex O’Donoghue, 40, a teacher, said of their daughter: “Delilah’s very bossy – it’s how little girls are, I think. 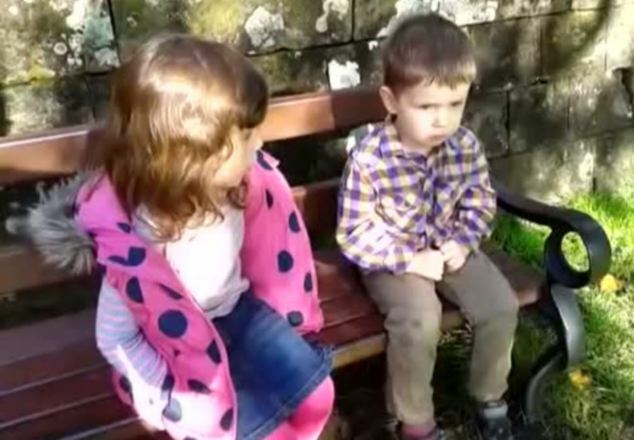 The clip shows Gabriel receiving the dressing down from his sister after he found himself in hot water with their father for spitting at another child in the playground. Delilah O’Donoghue was quickly on hand with sisterly advice – some of which belies her young years. “I’ll keep remembering you being about two and I’ll tell my friends that too,” she tells him. As the lecture continues, Gabriel hangs his head, swings his legs, fidgets with his hands and looks away. Referring to the child with whom Gabriel had apparently had the playground spat, she adds: “That boy’s old enough. You’re only two. “You’re not old enough for that boy to… do a fight. Lee O’Donoghue, a company director, said he posted the clip, titled You Need to Toughen Up A Bit, on YouTube last Tuesday. Lee O’Donoghue and his wife have now signed up with global video marketing company Viral Spiral, which represents hundreds of home-movie makers with the aim of maximizing profits from clips posted online. The couple said they had not decided how to proceed with marketing linked to the video, saying their first concern is the impact any deal would have on their children. The most viewed viral video of all time is of another pair of British siblings. The clip, called Charlie Bit My Finger, shows a little boy having his finger bitten by his baby brother and has been viewed more than 480 million times since it was posted in 2007. Their parents, Howard and Shelley Davies-Carr, from Buckinghamshire, also represented by Viral Spiral, have earned about £100,000 ($160,000) from advertising revenue and marketing deals. By today, 959,000 YouTube viewers had clicked on Delilah and Gabriel’s video. Viral Spiral said: “This one is certainly endearing as Delilah shows so much maturity in what she says.